Does The Good Earth have a plot? The story of Wang Lung, his land and his family could be considered a “rags to riches” story. At the beginning of the novel, Wang Lung is literally dirt poor. He is a farmer, and the son of a farmer, and he lives in a hut next to a field where he grows rice. Still, the land is his family’s land, not rented land, and Wang Lung manages to grow enough to eat to keep body and soul together. As time passes, his fortunes improve through his own efforts and those of his wife, as well as thanks to a stroke or two of good fortune. However, the novel is less a story than it is a chronological list of incidents. Events transpire. Wang Lung reacts. Each incident or event is like one bead on a string of beads, regular and even, or one hurdle in a series of hurdles on a track, none taller than any other. The story, the beads and the track all share a tendency to curve around and go back to where they came from. The Good Earth lacks a narrative mountain with an obvious rising action, climax and falling action. What makes The Good Earth interesting? Wang Lung’s life does not consist of a quest or grand adventure. Wang Lung simply passes through youth, adolescence, adulthood and senescence, sandwiched between others at different stages of the process, facing and overcoming obstacles from time to time. Memoirs and family sagas like The Good Earth are entertaining because we like to experience the vicissitudes of fate vicariously by reading about someone interestingly unlike ourselves, and yet perhaps not entirely different. The novel allows us to imagine life on a farm in 1920s China in detail, to imagine labouring in a field under the sun every day of the year with a wife and an ox, eating bread and garlic and feeling thankful for luxuries such as a handful of tea leaves or a morsel of meat. We feel the farmer’s gratitude towards the forces of nature when they provide for him, and we feel his helplessness when they do not. Stepping back, we feel privileged to be eating food that others have grown, reading words that others have written and taught us to read. Is The Good Earth easy to read? Certainly it is easier to read than the Chinese family saga The Dream of the Red Chamber, aka The Story of the Stone, which I finished reading and posted about in January of this year. The Good Earth has an intimate documentary quality that makes the character’s world feel as familiar to readers as it is to the characters themselves. For example, the narration tells us that Wang Lung has trouble climbing a stairway because it is the first time he has ever climbed stairs inside a house. It does not digress to describe the town’s architecture or to compare Wang Lung’s hut with the teahouse. It just tells us that Wang Lung feels that the building is strangely tall. The vocabulary is not technical, Chinese names and terms being almost entirely absent. The sentence style has a kind of Biblical simplicity which can seem either dull or grand but is unlikely to confuse. Nor is the book particularly long, so it is relatively easy to walk a mile in Wang Lung’s shoes, even though parts of his life are far from easy. 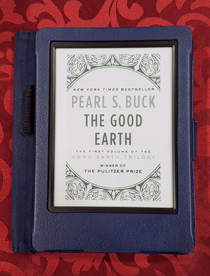 The books in the “Good Earth” or “House of Earth” trilogy are The Good Earth (1931), Sons (1932) and A House Divided (1935).